Over the weekend, the eighth annual Texas Tribune Festival wrapped up in downtown Austin. The nonprofit state journalism outlet attracts political and media big shots from all over the state and the nation. Sure, headliners like former Secretary of State John Kerry, former attorney general Eric Holder, U.S. House minority leader Nancy Pelosi, and Stormy Daniels’ attorney Michael Avenatti made certain that the Trump Administration didn’t suffer from a lack of attention. But the real heart of the festival is the panel discussions among city, regional, and state leaders, who sit in front of an audience and wonk-talk about the best ways to confront education, housing, criminal justice, and the economy to make Texas an even better place. One persistent theme that arose is that the state government keeps finding ways to pile on requirements and regulations for local governments while at the same time reducing its financial support for their efforts. Panelists on the whole weren’t hopeful for what next year’s legislative session might bring. But let’s zoom into North Texas. Here are 10 things that made it in front of a state audience this weekend. If it wants in on the bullet train, that is. As has been written about here and elsewhere many times, the Paris of I-30 spent years as the largest city in the United States without public mass transit. It took until 2018 for the city to enact its own program, and it’s a ride-share service called Via. State Rep. Chris Turner, whose district includes much of Arlington’s east side, said that if Texas Central ever gets its planned Dallas-to-Houston train up and running, and if the state and local governments find the money to extend the line from Dallas to Fort Worth (something Texas Central has no interest in doing on its dime), there will be no love for Arlington without the city joining either DART or Trinity Metro. “If Arlington doesn’t have a comprehensive mass transit system at that point, I would oppose an Arlington stop,” he said. Brandon Formby moderated the “Transportation for Tomorrow” panel with speakers J. Bruce Bugg, Celia Israel, Geanie Morrison, Robert Nichols, and Chris Turner at The Texas Tribune Festival on Sept. 28, 2018. The “Transportation for Tomorrow” is … more highways? Turner’s comments about Arlington came during a session purportedly about the future of Texas mobility. 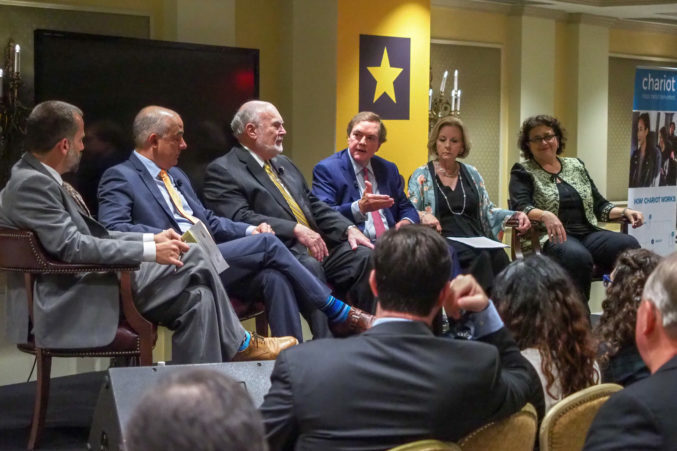 Also on that panel were the chairs of the Texas House and Senate transportation committees, as well as the chairman of the Texas Transportation Commission. Judging by the bulk of their discussion, the Texas Department of Transportation will continue to focus on further expansion, growth, and maintenance of the state’s highway network, particularly though the building of toll roads, since the panelists made it abundantly clear that there is zero appetite among legislators for raising the gas tax to pay for any of it. Have You Met Philosopher Mike? The other panelists—former New Jersey governor and EPA administrator Christine Todd Whitman and former Oklahoma Congressman Mickey Edwards—agreed that the widening division between politicians on either side of the aisle originates with the most ardent supporters of one political extreme or the other. Those extremist voters are the most likely to participate in primary elections, which tend to deliver candidates unwilling to compromise across party lines even as polls show that broad majorities of Americans are united on issues like the need for gun control and universal healthcare. Rawlings also advocated for making voting as easy as summoning a Lyft or Uber on your phone in order to get more people engaged in the political process. “It’s so complicated that nobody votes,” he said. When moderator Dave Levinthal of the Center For Public Integrity introduced Steve Wolens, who once represented Dallas in the state legislature (and is married to former Dallas Mayor Laura Miller), Wolens made sure to note that he’d served his 24 years in Austin both “undefeated and unindicted.” It came at the start of a panel that asked whether “government ethics” is an oxymoron. While bemoaning that the Trump Administration has an attitude of doing the bare minimum and getting away with as much as possible when it comes to ethics, none of the panelists was ready to give up on the idea that government can and should operate within a set of standards for what’s right and what’s wrong. Wolens offered hope for the future in recalling a piece of Texas’ past. In 1989, poultry magnate Bo Pilgrim walked the floor of the state senate, handing out $10,000 checks to senators a couple days before a vote on a workers’ compensation bill. Within two years, lawmakers had made it illegal to make campaign contributions at the Capitol or while the legislature was in session. “People respond to outrageous behavior,” Wolens said. We’ll find out how true that is in the upcoming midterm election. KERA’s “Think” host Krys Boyd hosted a panel titled “Education Reform That Makes the Grade.” It was largely a discussion about whether publicly funded charter schools benefit or undermine the traditional schools with which they compete. Todd Williams of Dallas-based education nonprofit Commit Partnership fell somewhere in the middle of the debate, recognizing that there are some great charter schools but there are many that aren’t serving kids well. He was quick also to tout the changes Dallas ISD has instituted in recent years to offer greater school choice options within the traditional system, including the opening of two socioeconomically diverse campuses. But Williams, who also advises Rawlings on education policy and serves on the Texas Commission on Public School Finance, argued that the most effective tool in a district’s education arsenal is recruiting and retaining great teachers. The Dallas ISD board trustee probably could get himself elected POTUS—if he were old enough to run and if (judging by the audience response) the electorate were limited to those who attended his Saturday morning panel. Titled “Are Students of Color Getting a Raw Deal?,” Solis delivered an impassioned message at its close to address the larger societal problems that need confronting before economically disadvantaged students can be served equitably by the education system. Solis was one of the district’s two trustees who got his colleagues to pass an equity resolution, which mandated that Dallas ISD deal with the city’s history of segregation and red-lining, and the impact it had on the student body. U.S. Rep. Marc Veasey, a Democrat from Fort Worth, sat on the same panel as Solis and pointed to another contributor to the inequities in schools: independent school districts. Because they’re financed by local property taxes and because school quality is a major driver of property values, ISDs result in a self-feeding cycle of rich districts getting ever richer (and ever higher-performing) as the effects of their advantages over neighboring districts compound over time. While he stopped short of calling for Texas to shift to school districts contiguous with county lines, he suggested doing so would allow tax dollars to be distributed somewhat more equitably. “The [ISD] system is definitely set up to perpetuate segregation,” Veasey said. Congresswoman Eddie Bernice Johnson, whose district runs from Love Field down to encompass most of southern Dallas County, participated in a discussion about what can be done to keep residents from being priced out of neighborhoods in the urban core. She urged better development planning and finding ways to mitigate the impact of gentrification. “We’ve let that get too far out of hand,” she said. But what really stuck with me from this panel was something San Antonio City Councilman Rey Saldaña said just after Johnson’s remarks: “Being poor is expensive.” When people are priced out of the neighborhoods anywhere near their jobs, or driven to more rural areas short on public services like transit options, he’s right. Lawrence Wright, author of God Save Texas, and Stephen Harrigan discuss the future of Texas at The Texas Tribune Festival on Sept. 29, 2018. 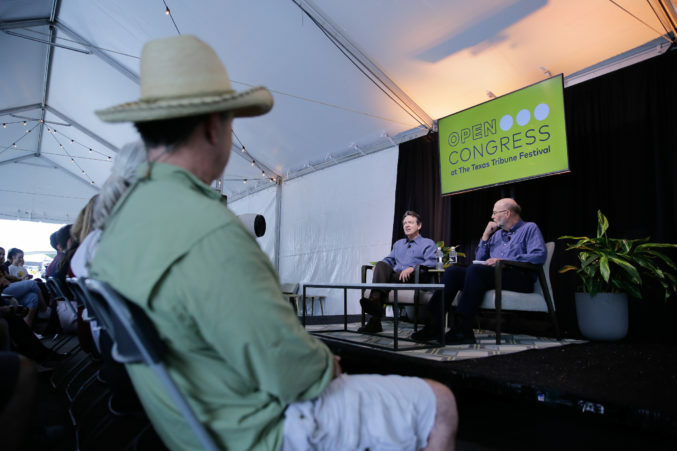 Author and journalist Lawrence Wright had a public conversation with his friend and fellow writer Stephen Harrigan during a session promoting Wright’s latest book, God Save Texas. In explaining why he’d been eager to leave Texas and never return when he graduated Woodrow Wilson High School in 1965, he noted what a vilified place Dallas was in the years after the assassination of President John F. Kennedy.